November 26 from 10:30 a.m. – 4 p.m.
Small Business Saturday ushers in a day filled with festivities and chocolate. At the Seventh Annual Art & Chocolate Walk in Palisade, free chocolate takes center stage with numerous businesses offering unique holiday gifts and fun for the whole family. Participating shops and studios include The Blue Pig Gallery, Wedel Pottery Studio, Casual Gal Silversmith, Lavender @ Heart, Underwood-Turning, Lupita’s Bizarre Bazaar Too, Slice O’ Life Bakery, Sandy King Studio, Palisade Historical Society, Craig Gallery and Everything Collectible. 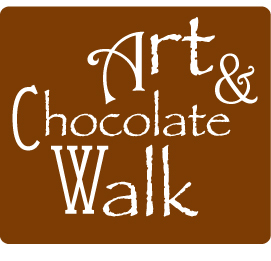 The event is free and everyone is encouraged to complete a “punch card,” by visiting all of the Art & Chocolate Walk locations. When the card is punched by all participating merchants, it is entered into a drawing for a large basket brimming with fine art and chocolate from every vendor. A map of all participants’ locations will also be provided. A good place to start is The Blue Pig Gallery. Next Story → The 3-5-7 is officially Open!